We were delighted to have Internet access to the Carnegie Hall performance by the Cincinnati Symphony Orchestra and the May Festival Chorus of R. Nathaniel Dett's The Ordering of Moses on Friday, May 9, 2014. How often is R. Nathaniel Dett's attractive 1928 work Cinnamon Grove (15:20) Suite for Piano heard, even after pianist Phoenix Park-Kim and violinist Merwin Siu released their world premiere recording, Deep River, on MSR Classics MS 1372 in 2011? Yesterday was the birthday of William Grant Still (1895-1978), whose five symphonies are at last available in a series of three discs on Naxos, recorded by the Fort Smith Symphony, conducted by John Jeter. Symphony No. 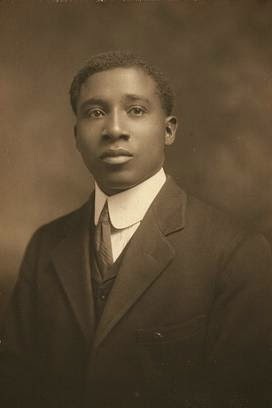 1, the Afro-American, is most likely to be heard on the radio, with few playings of Symphony No. 2, Song of a New Race, and almost none of Symphonies 3, 4 and 5. Florence B. Price's Concerto in One Movement and Symphony in E Minor on Troy 1295 are rarely heard, and her delightful Dances in the Canebrakes on Cambria 1097 are aired even less often. Dozens more examples could be listed. The past two decades have witnessed the recording of CDs from LPs as well as many premiere recordings on CD. 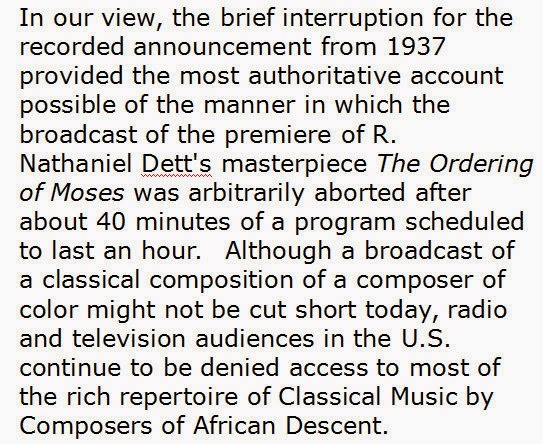 The increased availability of repertoire of Composers of African Descent means broadcasters could make their programs far more representative of artists of color than they presently are.